Pep Guardiola paid the Clarets a back-handed compliment when describing them as the “most British of teams” following the 1-1 draw at Turf Moor. Burnley boss Sean Dyche revealed that the plan was to go long and strong and play in to their backline after Johann Berg Gudmundsson had snatched a late point, and it was an effectiv e ploy identified by his opposite number. The visitors had their chances to win, most notably through Raheem Sterling, but the Spaniard acknowledged that an advantage so slender wouldn’t be enough. 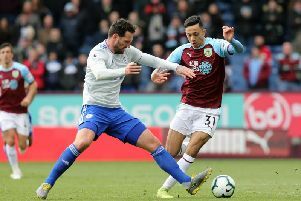 “Of course we are frustrated in terms of the result but the performance was outstanding against a Burnley side who are the most British of teams in terms of long balls and the way they play,” he said. “Football is about goals. We needed to score the second, third and fourth when we had the chance. “When you arrive in the last 15 minutes at Burnley 1-0, this is what can happen.